Today: Baked oatmeal, just right. You know how things sometimes just don’t quite work out the way you envisioned them? Yeah. This was originally supposed to be a savory baked oatmeal -- twinged with miso and sesame oil, stuffed with greens and mushrooms. It seemed like such a good idea! Actually, I still think it’s a good idea, but somehow it didn’t play out properly in the execution. It wasn’t bad, but it was a little weird. Good...ish. Mostly weird, if I was to be honest with myself about it. At any rate, I didn’t feel the need to save it and eat it for breakfast the next day. Okay then, fine. A change of plans was in order. I decided I would use leftover parsnip purée from the parsnips I was preparing for dinner to make chai-spiced parsnip pancakes. Doesn’t that sound good? I know! I think I’ll actually still try them some time. But, we ate all of the parsnips. No leftovers, no pancakes. Oops. At the risk of sounding dramatic -- because breakfast, or at least uncertainty in breakfast, is nothing if not dramatic -- things seemed dire. If we had been out of coffee beans as well, I would have given up right there. But this story has a happy ending because we weren’t. And so, fueled by two cups of coffee on an empty stomach and the realization that I still had chai spices and leftover oats, I decided to make a chai-spiced baked oatmeal. 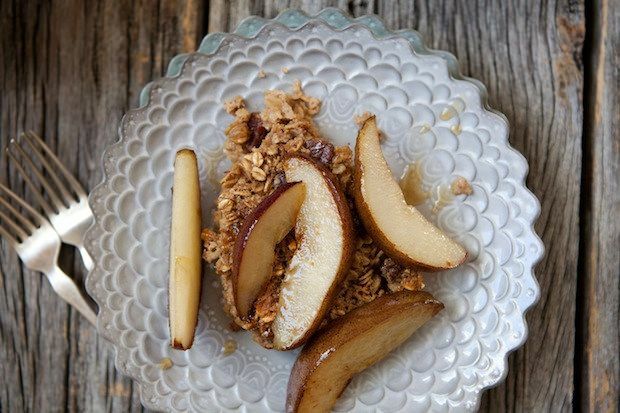 And, while I was in the process of snatching victory from the jaws of defeat (oh yes friends, victory comes scented with cardamom and black tea) I figured I may as well rub it in defeat’s face, so I made maple-syrup cloaked pears to top it all off. And it was so good. Sometimes when things don’t quite work out the way you envision them, they wind up working out better. Even the leftovers are better. This was wonderful. I made a blueberry compote to go along with it and I added dried cranberries to it. It can be your breakfast or dessert with vanilla ice cream. Love that it makes enough for a weeks worth of breakfasts. 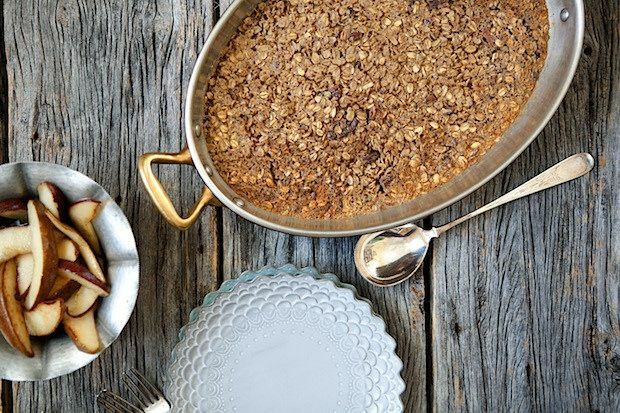 Could you use stone ground oats? I think you might be able to, but you'd probably have to bake it for longer, so it might require more liquid. I haven't tried it. "Loose leaf chai blend" - Could I open my Bigelow Chai Tea bag and use that? Totally. Actually, you could probably just stick a couple tea bags in the warm milk. Then you wouldn't even need to strain it, just pull the tea bags out when it tastes strong enough to you! This looks delicious. Perfect for a predicted snow day tomorrow. Thank you so much! And yes, soooo perfect for a snow day! Thanks Peggy! And, the plates are from Anthropologie. I don't know if they still carry them, but I love'em!